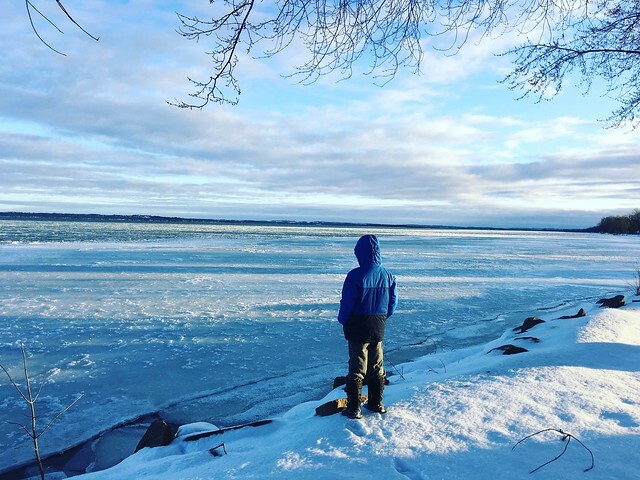 In walking along the icy shoreline of Lake Simcoe with our firstborn in late December, I found myself feeling grateful for having lived long enough to know that our boys will remember me no matter what happens from here on out. This was my greatest wish from the time this young fellow arrived into our arms in 2005. Today, my new greatest wish is that our boys grow up to feel that they can come to me to talk about anything. No matter how grave their concern, how intense their anger, disappointment, or sadness - even if I am a root cause of their suffering - I hope I will have built up enough trust in my emotional bank account with them that they want to share and discuss their feelings, knowing that I will do my best to understand them. Until recently, my parenting instincts have been to over prepare, protect, and guide them. At 11 and 9 years of age, I am beginning to experience moments of surprise as I discover thoughts and feelings within them that I could not have anticipated - this has strengthened my resolve to listen more, understand more, and to own up to moments when I don't behave as well as I aspire to. This last habit has proven to be incredibly powerful in building their trust in me - whenever I own a moment when I have been impatient or quick to become angry, healing and forgiveness have come forth almost instantaneously. A sincere apology from the heart along with earnest expression of my desire to behave better next time remains one of the most powerful ways I can be the father I wish to be to them. If you have any thoughts on how you foster trust with your children or what your parents did to earn your respect and affection, I would appreciate you sharing in the comments section below. My father was a man of few words, but led by example. He worked from 8am-5pm 5 days a week for about 40 years at the same job,a draftsman for the Gulf Power Electric Co. to support his family, namely my 2 sisters and I, each one year apart in age. He remained faithful to my real mother during this time, according to his Catholic belief that marriage is for a lifetime, in good times and bad, although he had to institutionalize her when I was 3 because she was schizophrenic. (I was actually mothered by my Great Aunt, Mabel Pfeiffer, who stepped into the void, according to God's will, to meet the childrearing needs left by my mother's departure). My father never got visibly angry, at least, I never saw it. He was principled, bore much suffering without complaint, and was steadfast in his ways. Although he may not have actually told me he loved me all that often, as look back on our relationship, I know that his entire life was a demonstration of love toward his family. He is a perfect example of the adage "Actions speak louder than words". Amen. Thanks, Dr. Kim, for sharing this parenting point of view. No one teaches us how to be good parents unless we had good role models and that's unfortunately rare. I myself did not have a good upbringing. I was not treated as an individual at all and not given a safe outlet to discuss my real feelings and get guidance in the challenges of growing up. But I cannot blame my parents. They just didn't know or couldn't be that kind of a parent. We can't choose our parents but if they love and support us as adults that's good enough. And mine do even though they still are not perfect. That said, I raised my daughter with what I felt was missing in my upbringing, I opened the door for any communication no matter how uncomfortable and I let her make mistakes or skillfully steered her away from the ones she was not old enough to recognize. Sometimes a parent must use a lot of skill to get a child to think the right choice was indeed their idea in the first place;) So my daughter is now a well adjusted young adult, and still knows that none of us are perfect. And that's all I really wanted. Your boys are one of the luckiest ones to have parents like you and your wife. Good luck to you both!